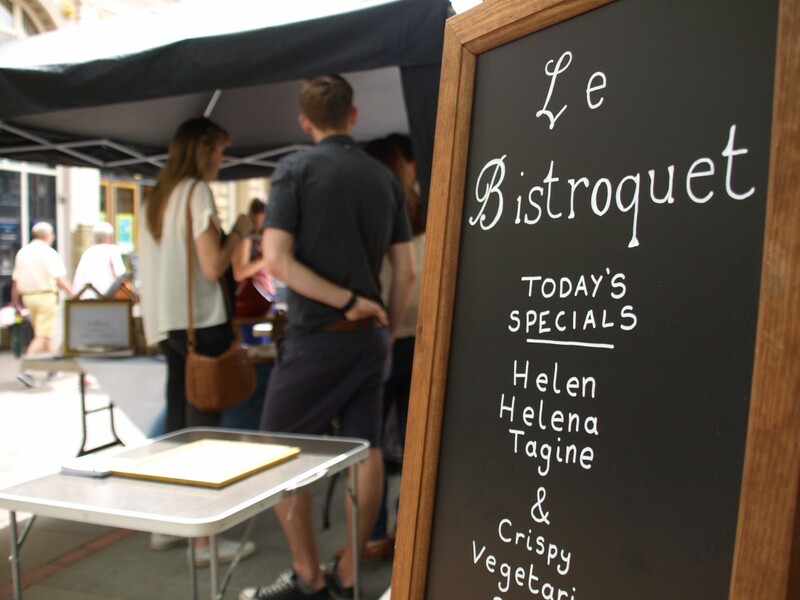 Le Bistroquet is a pop-up restaurant where the menu needs you! You are invited to Leo’s Bistro for an aperitif. Join us in this pop-up social space where the menu needs you. Whether you’d like to share a taste of home, or discuss your latest culinary experiment, the chef at this unusual establishment is prepared to feed you in exchange for yours and your grandmother’s kitchen secrets! Pop in anytime, have a natter with a waiter and your fellow customer; and when you’re ready, add your own recipe to our collection of publicly donated step-by-step guide to the people’s favourite dishes! Le Bistroquet is a pop-up performance intervention devised and hosted by Leo Burtin. The visual & costume design elements of the work were considered in collaboration with Robin Goodings. Photographs © hÅb/Word of Warning (Hazard) July 2014. Le Bistroquet is produced Becci Sharrock, supported by Talk with LEAP as part of the Homemade series, with thanks to Catherine Shaw.